I have a large hillside area in Pennsylvania, where usually weeds are out of control. For the next year, I am thinking about using some kind of ground-cover plants such as English Ivy to cover the area. I would like to know if I need to lay landscape fabric before doing so. Can it prevent weeds from coming back next year? Think twice, no three times before planting English Ivy. It is considered an invasive species in the US, and on the "noxious species" list of 46 States. Basically, plant that stuff and you risk it becoming a much bigger problem than any weed problem you have at the moment! Garden centers should be shot for stocking that stuff. Sorry, had to say that! Ground cover is the best long term way of keeping weeds down. And it looks good too. Just choose something native. Landscape fabric is all the rage at the moment and on another question I suggested it for strawberries, and I have used it under edging stones. However, I am not inclined to use it over large areas. First it does not rot down (or not quickly enough - our city used it under a retaining wall at the front here and it hasn't rotted after almost 10 years). Next, you have to poke holes in it for the roots. This might be fine for shrubs, but it would not work for ground cover that spreads (which is what you really want). So I would be inclined not to use it unless you can find a type that rots in, say, 3 years to give short term protection only. What can you use instead? Aggressively weed first, including all roots that you can get. Weedkillers might be an option (I know a rainforest restoration project that starts with a treatment of Round-Up!). Plant your ground cover plants, and then mulch. 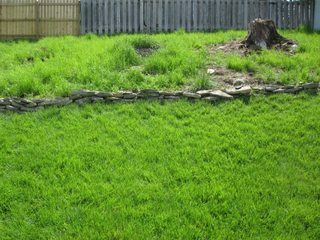 Be aggressive with weed removal when you see them (invest in a hoe if necessary) - this is what I have done with my pepper beds and currently do with my xeriscape bed (we have an aggressive grass problem but one year of aggressive weeding complete with root removal and the second year is much easier). Agree with "winwaed" answer, especially the part about "English Ivy". 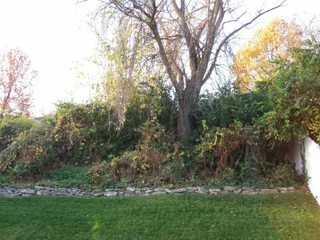 Late last year (November 2010) when I started working on our (Missouri) native garden -- approx 50 feet (15m) x 30 feet (9m) on a an approx 30° slope -- I decided not to use a landscape fabric or put down a layer of mulch. Q. Why didn't I put down a landscape fabric? A native landscape in nature doesn't have a landscape fabric layer. I did think about getting a bio-degradable landscape fabric, something that would break down within 2 years at the most, and would help with any soil erosion while the (≈170) plants established themselves, but I decided it wasn't worth the expense or time to put down. To date I've lost 2 plants (which have been replaced) due to soil erosion when we experienced almost unbelievable rainfalls (+3inches / +75mm in 24 hour periods) during May, first week of June. Now the plants have been in the ground more than 3 months, I'll be surprised if I lose anymore due to "soil erosion". Q. Why didn't I put down a mulch layer? Getting enough mulch material onto the slope area didn't seem to be worth the amount of work involved. Especially when I factored in, mulch shouldn't touch the plants (for plant health reasons). 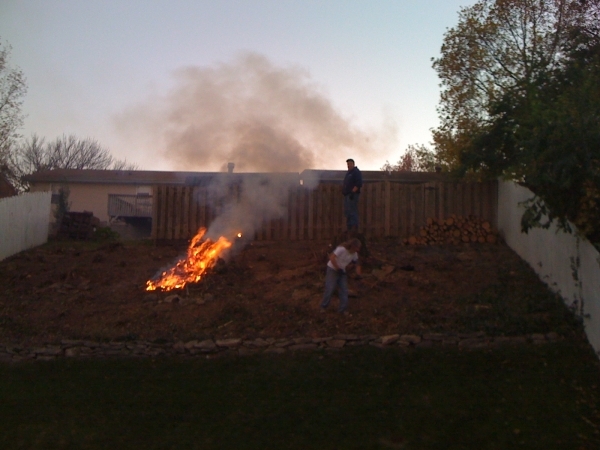 Beginning of November 2010 we had a large "dead" (unsafe) Willow tree taken down, removed professionally. After the tree was removed, by hand I cleared the area down to the ground and sowed a Winter cover crop of Annual Rye grass. Read a lot! about Missouri native plants and spoke with a handful of Missouri "expert" gardeners. Put together "Plant type list". Drew the garden in AutoCAD and played with different plant layouts. Choose the layout we liked most and from that extracted a complete "Plant type/number list". Ordered all the plants from, Missouri Wildflowers Nursery (no affiliation, just a very! happy customer). To save some money, we bought "plug" plants ie Very young and small plants. After a lot! of soul-searching and speaking with those same Missouri "expert" gardeners, I decided I would use (basic/original) Roundup (Active ingredient: Glyphosate). I considered going the "Soil solarization" route, but I wasn't prepared to wait until April 2012 before I could start planting. Beginning of April 2011, I again by hand cleared the area down to the ground. 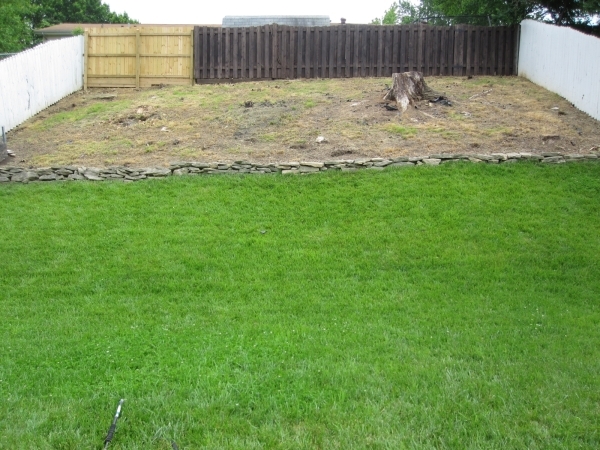 Afterward I selectively applied "Roundup" to unwanted plants, vines, that I'd cut down to the ground. Two weeks later (mid April), I again by hand cleared the area down to the ground, then selectively applied "Roundup". Two weeks after that (end of April), I again by hand cleared the area down to the ground, then selectively applied "Roundup" for the last time. 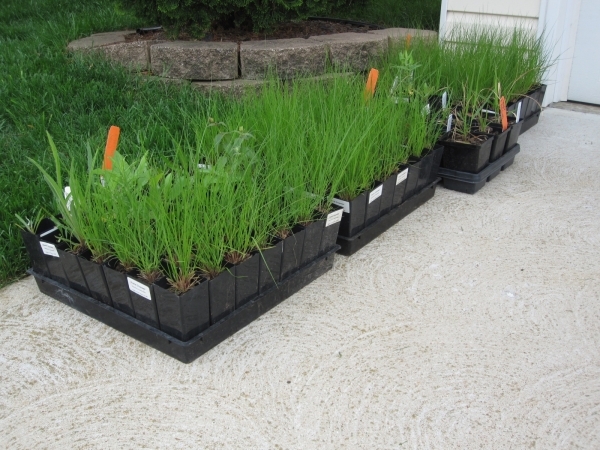 End of April 2011, I collected all the "plug" plants I'd ordered. Due to the weather (unbelievable rainfall) I wasn't able to get out into the garden and plant until 22nd May 2011. Before doing so, I once again by hand cleared the area down to the ground. Finished planting on 24th May 2011. Every Sunday morning I go out into our native garden for an hour with a hoe in hand and clear any unwanted plants that have popped their heads up above the ground. The past 3 or 4 weeks I've definitely noticed a lot! less unwanted plants popping up. I'm now out there hoeing for 30 minutes at the most -- and bare in mind I'm an annal retentive freak (so says my wife). During July and August (unbelievably hot, we had 21 continuous days of +100° / +38°C temperatures with zero rainfall) I've had to water the native garden every 2 to 3 days. I've lost 5 plants (which have been replaced) due to excessive heat. Next year I expect to water our native garden once a week at the most during excessive heat periods -- the plants should well be on their way to being established by then. Landscape fabric should NEVER be used for weeds. What it was designed for was to place between soil and gravel so that the gravel doesn't sink down into the soil and disappear. Plastic or this fabric under mulch stops all the processes between plants and soil and organisms. The best thing I've found for weed control that also feeds your soil is decomposed organic mulch. 2-3" every other year does better than bark and fabric combined to control weeds. The absolute best decomposed organic mulch is human poo, mixed with sawdust and completely decomposed. Fine, uniform textured, dark taupe, no weed seeds, no pesticide residues and the soil and plants love it. I don't even pull weeds, just dump this right on top. Keep away from the base of woody plants. Gorgeous, easy and what nature would do in your place. Not for vegetables but everything else...check with your local sewer companies. The only decomposed organic mulch that is tested, 5X, and you can trust unless you make your own mulch. It is NOTHING like the original material. If it smells at all it has not been composted properly. Find another source. Using undecomposed mulch robs the soil of nutrients and causes the soil organisms necessary for plant health to go dormant until there is decomposed organic mulch to eat. If I got the chance, I'd ban plastics, fabric, bark and chips being used as weed control. They are turning our urban areas into deserts! Not the answer you're looking for? Browse other questions tagged weed-control ground-cover landscape-fabric or ask your own question. How are weeds controlled in a butterfly garden? What is a good ground cover for street frontage instead of lawn? 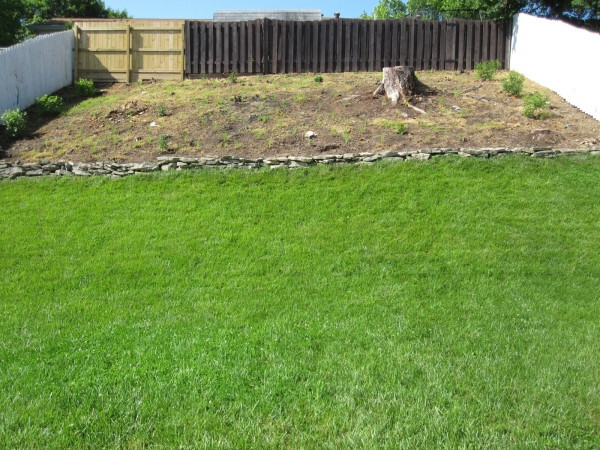 Amending a barren yard with compost: dedicated weed barrier or no? Is it ok to leave landscape fabric exposed in an area without plants and foot traffic? 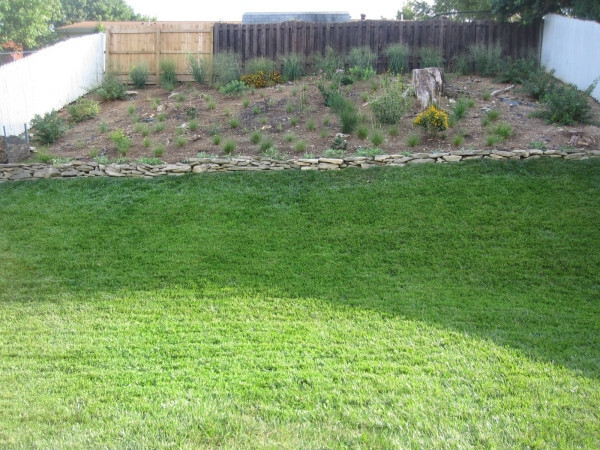 What is the difference between landscape fabric and ground cover? Is landscape fabric stressing my plants?